The island nation of Japan is a country of many contrasts, climates and cultures thanks to its long shape stretching from snowy Hokkaido in the north to the tropical islands of Okinawa in the south. 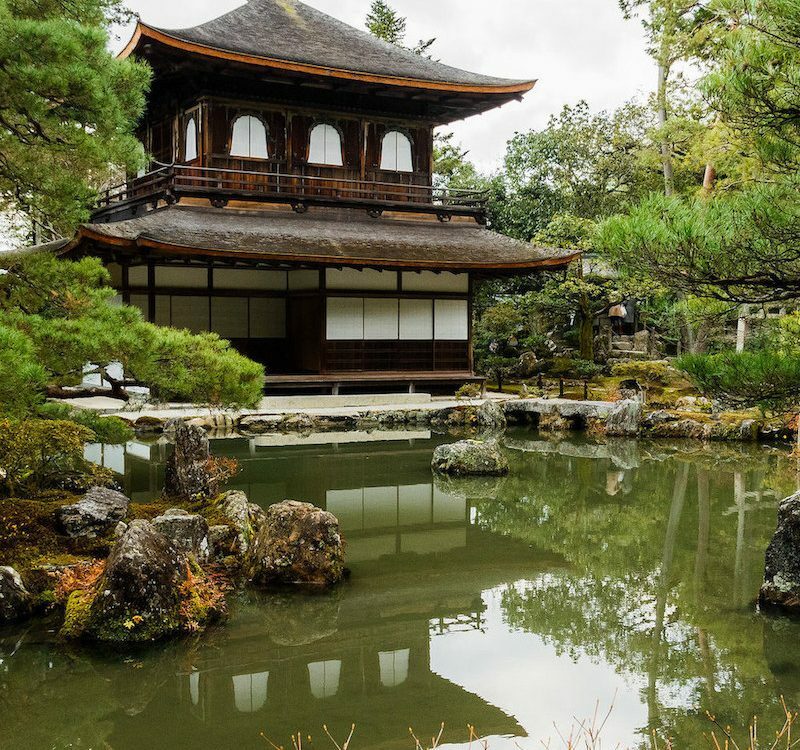 While any itinerary to Japan should include must-visit places like the fast-paced capital Tokyo, or ancient Kyoto, famous for its old charm and many temples and shrines, there are so many other places in Japan that are less famous (or downright underrated) but equally worth visiting. We’re taking you off the beaten path and show you 10 incredible underrated places you need to visit in Japan. 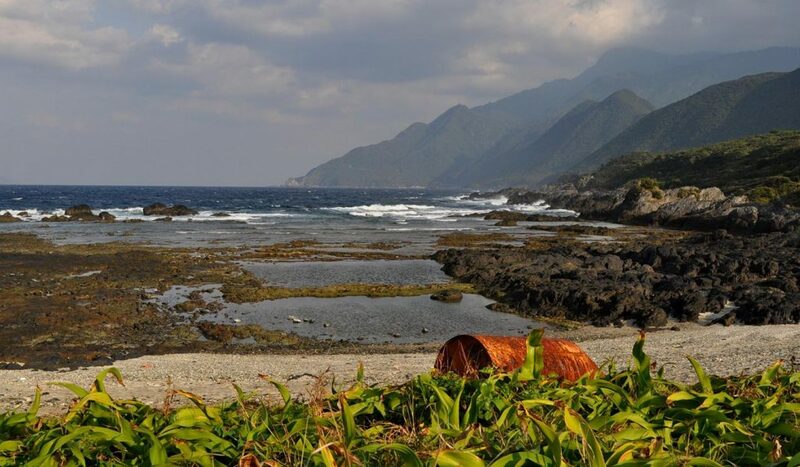 Measuring about 130 km in circumference, the subtropical Yakushima Island is located about 135 km south of Kagoshima, with a population of over 13,000 inhabitants. 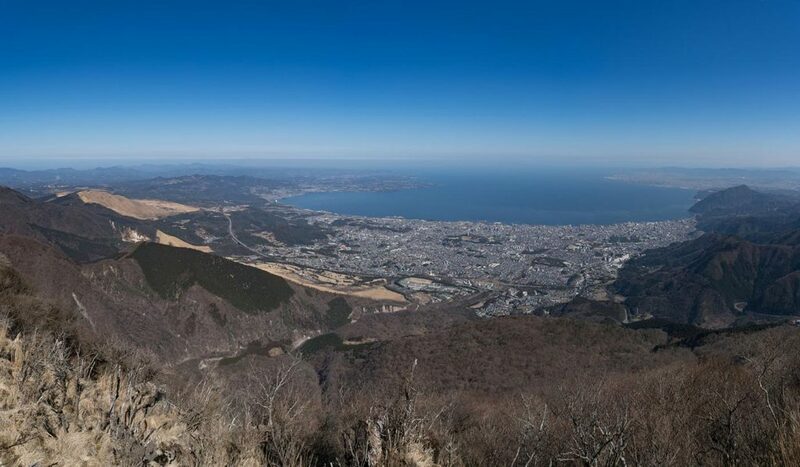 Also known as “The Alps on the Ocean”, the almost circular island has more than 45 mountains over 1000 meters high with Mount Miyanoura being the highest in all of Kyushu standing at 1,936 meters. Registered as Japan’s first World Natural Heritage Site in 1993, the mostly mountainous island has a unique ecosystem thanks to its isolated location attracting a lot of rainfall. Large parts of the island are covered by a cedar forest with many ancient trees older than 1000 years. 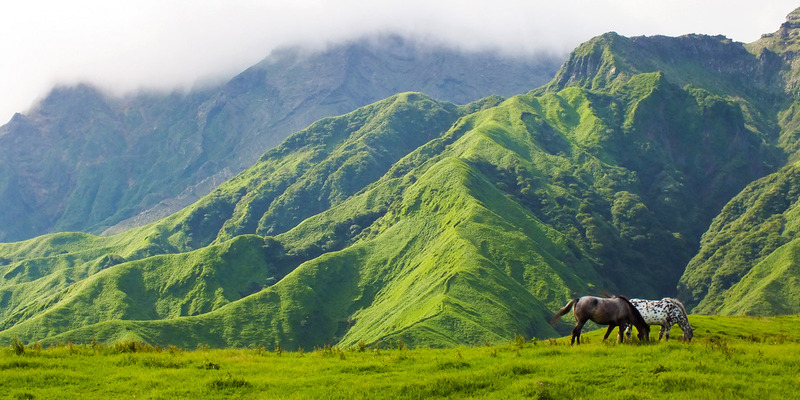 If you love trekking, there are excellent hiking tracks ranging from easy to the more experienced. 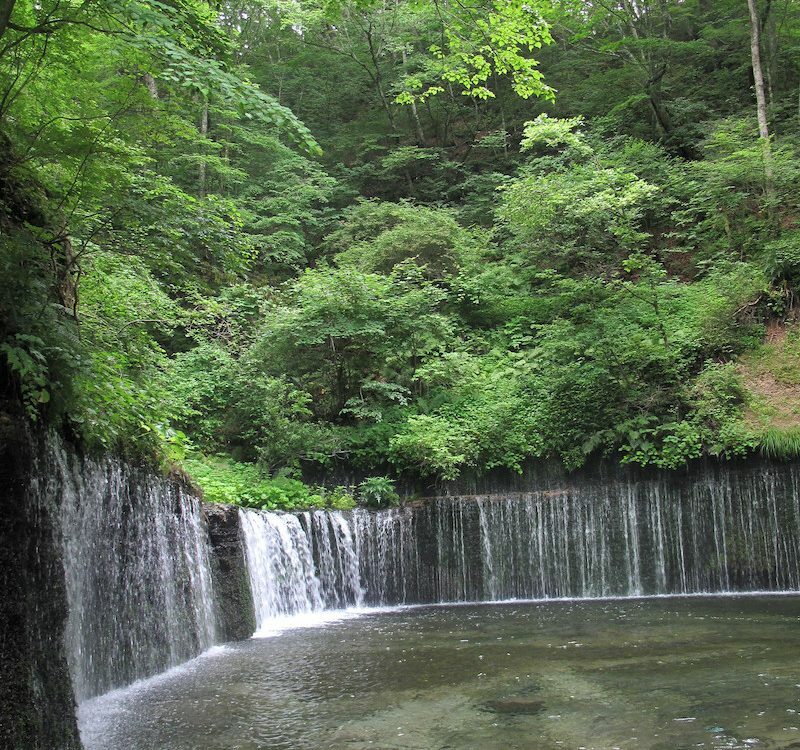 One of the places you have to visit is the Shiratani Unsuikyo Gorge starting at an altitude of 600 meters. The moss covered forest of ancient cedar trees is said to be the inspiration for a scene of the movie “Princess Mononoke” by Hayao Miyazaki. Also visit the Jomonsugi, the giant cedar tree believed to be between 2000 and 7200 years old, the oldest tree in Japan. Japan’s northern most, and coldest out of the four main islands, is Hokkaido. 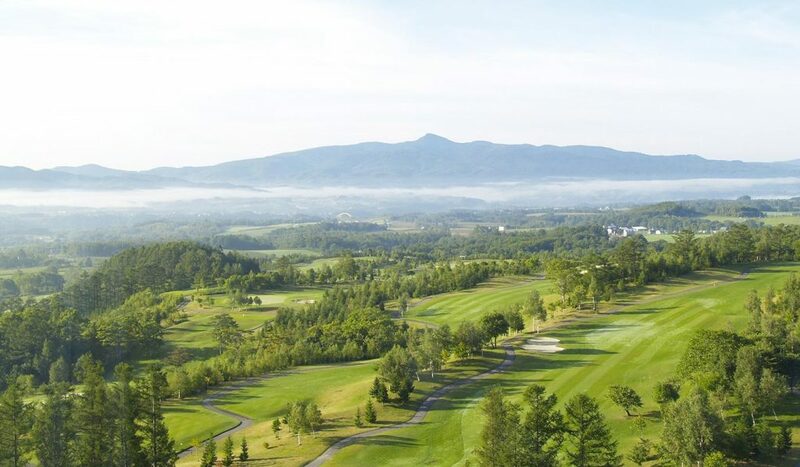 You can almost call Hokkaido a different country as its geography and culture is distinctively different from the main island of Honshu and Japan’s second largest island. Although the climate is cold, Hokkaido’s sub terrain is full of volcanic activity and natural hot springs can be found all over the island. 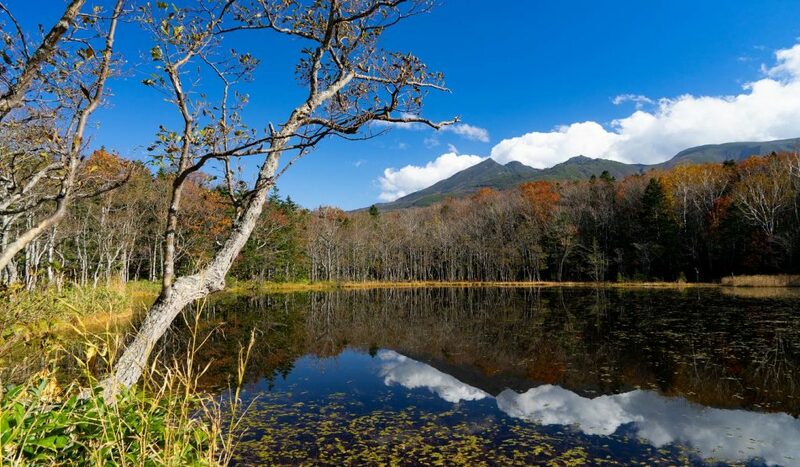 The many active volcanoes and snowcapped mountain ranges give Hokkaido its rugged beauty. The summers are cool and the winters icy. 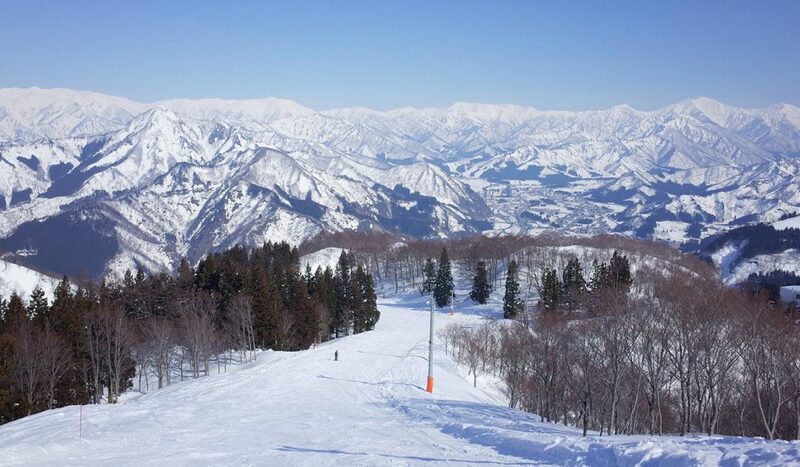 Because of the high quality of powder snow falling in the winter in the mountains, Hokkaido is a popular destination for skiing and other winter sports. There are many spots to visit and things to do in Hokkaido. 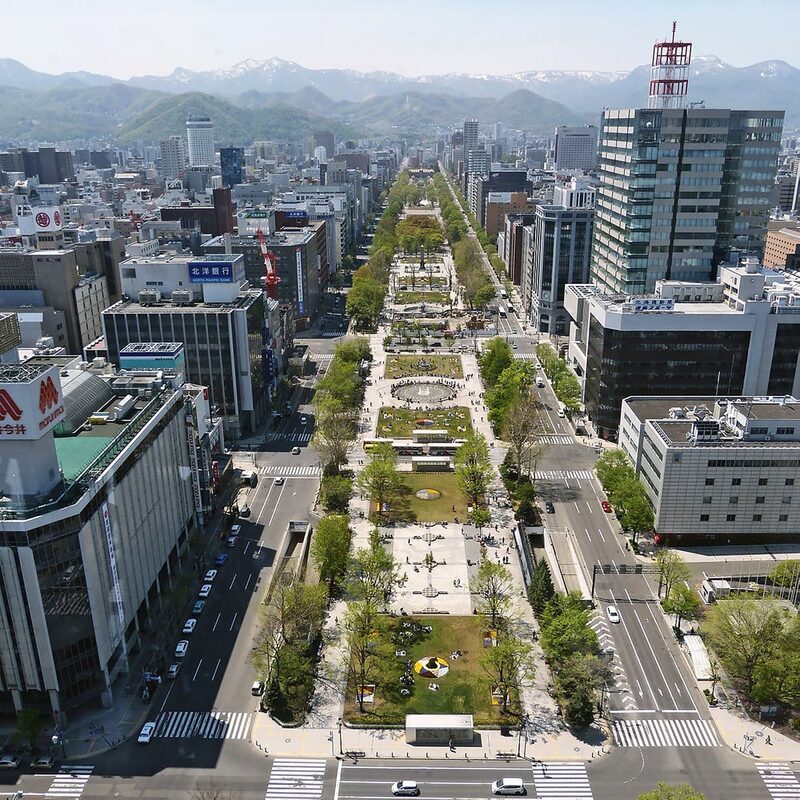 Sapporo City, which is the fifth largest city in Japan, is the capital city of Hokkaido prefecture. The capital is famous for its Sapporo-style ramen and the popular beer brand Sapporo Beer (don’t forget to visit the famous Sapporo Beer Museum). If you go during the winter (starting the end of January), you can admire breathtaking ice sculptures that light up at night during the annual Sapporo Snow Festival. To the south-west lies the famous ski resort of Niseko. The area is prized for its ultra fine powder snow making it the perfect place for any kind of snow sports. Visit Noribetsu to find one of Japan’s most famous hot spring resorts. The area is famous for its many different kinds of hot springs thanks to the volcanic activity underground. During the summer, visit Furano, a picturesque rural area known for its quality produce and many lavender fields. Far to the north-eastern top of the island lies Shiretoko National Park, one of Japan’s most beautiful and unspoiled parks. Many wildlife like brown beers, deers and foxes can be seen, and the air is clean and in the winter you can see drift ice drifting from northeastern Russia across the Sea of Okhotsk. There is simply to much to see and do in Hokkaido that a visit to this unique island is a must on your itinerary! The beautiful villages found in Shirakawa-go, in the remote Ryohaku Mountains in Gifu prefecture, are something straight out of a fairytale storybook. 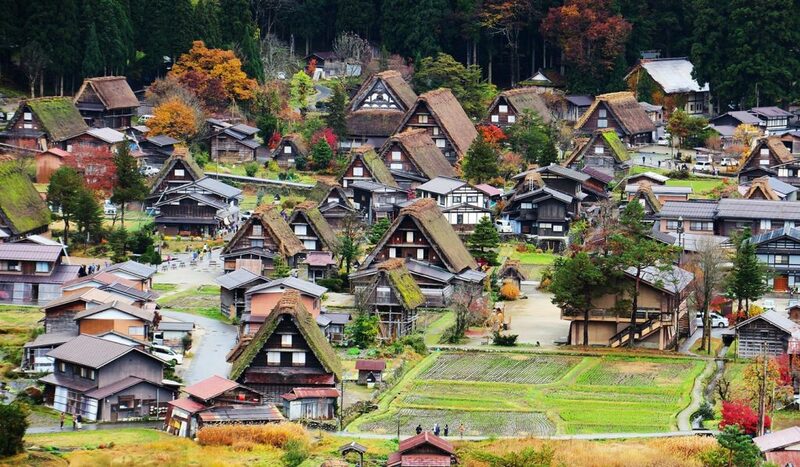 The charming villages are famous for its wooden houses that use a unique construction called Gassho-zukuri. The wooden beams used to create the steep roof is said to resemble “hands in prayer”, translating to “Gassho” in Japanese. To withstand the weight of the heavy snowfall during the winter, the roof is thickly thatched and often requires the help of the whole village. The houses owe their characteristic construction due to production of silk worms, requiring large amounts of storage space. The steep roofs are spacious, and are divided into several layers, to further increase the surface. Beds of silk worms are stored here and the airflow and temperature in the attic create a perfect breeding environment for the production of silk worms. Visit the villages of Ogimachi, Ainokura and Suganuma and pay a visit to the many farmhouses turned open air museums for a unique view of the life of bygone days. Shirakawa-go can be enjoyed any time of the year thanks to its four distinct season, but during the winter, when the villages are illuminated, Shirakawa-go becomes magical. If you want to learn more about Shirakawa-go, check out our guide. One of the most well known (and best) onsen can be found in Beppu, situated in Oita prefecture on the southern island of Kyushu. Blessed with many geothermal spots Beppu is divided into eight major hot spring areas, often referred to as the “Eight Hells of Beppu”. Steam rising from deep within the ground can frequently be seen all over the city of Beppu, giving it a mystical appearance. For a full on Japanese experience, opt to stay at a traditional Japanese ryokan (Japanese style inn), and relieve your body of stress by soaking in one of the many natural onsens. Besides hot springs, you can also find mud baths, sand baths and steam baths all there to help you relax. Then try the local cuisine, “Steam Hell Cuisine”, which uses a traditional way of cooking using the natural hot steam venting from the ground. Or visit the many “Jigoku” or “Hells”, spectacular hot springs that are only for viewing, found in several locations. Takasakiyama Monkey Park is located at the base of the 628 meter mountain, Mt. Takasaki. This park, home to about 1500 wild Japanese macaques, can be easily visited from Beppu City and makes for an excellent day trip. Together with friendly local people who will strike up a conversation with anyone, the quaint and charming city of Beppu is your destination to go to if you are looking for a first class onsen experience. You can often find foxes in Japanese stories and folktales and are usually depicted as intelligent beings with the ability to shape shift into humans. In ancient Japan, foxes and humans have lived close together, and foxes were seen as “witch animals” with paranormal abilities. This longstanding relationship with foxes have made them beloved animals and there is a village in Japan where the inhabitant are all foxes. You heard it right! Located in the mountains near the town of Shiroishi, you find Zao Fox Village. In this preserve, you can find over 100 foxes freely roaming around. Six different species such as the cute Japanese Ezo red fox, the more rare silver blue and shadow foxes can be observed from close by. 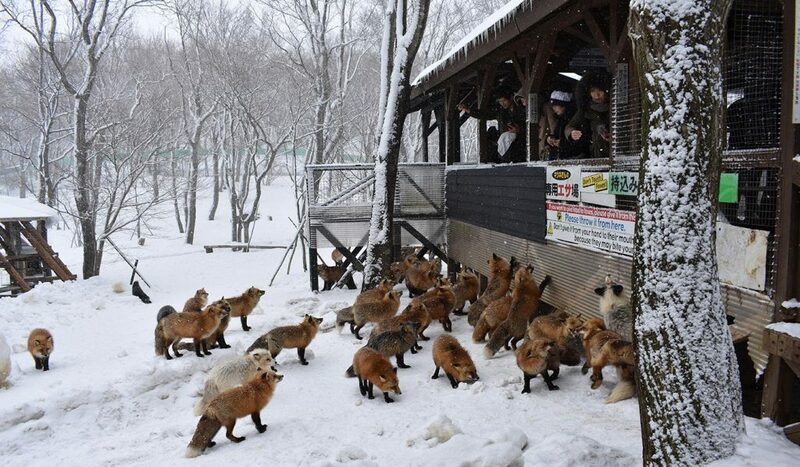 Visitors can not only pet, but also buy a small pack of fox food to feed them. Although you might want to take one of these uber-cute fluffy animals home, be aware that the animals are not domesticated and be cautious when approaching or feeding them. If foxes weren’t cute enough, how about a whole island of fluffy rabbits? Off the coast of Hiroshima, you find the small island of Okunoshima. Although Okunoshima has a dark past for its role during World War II, nowadays the island is inhabited by over 1000 wild rabbits that roam the forests and fields. 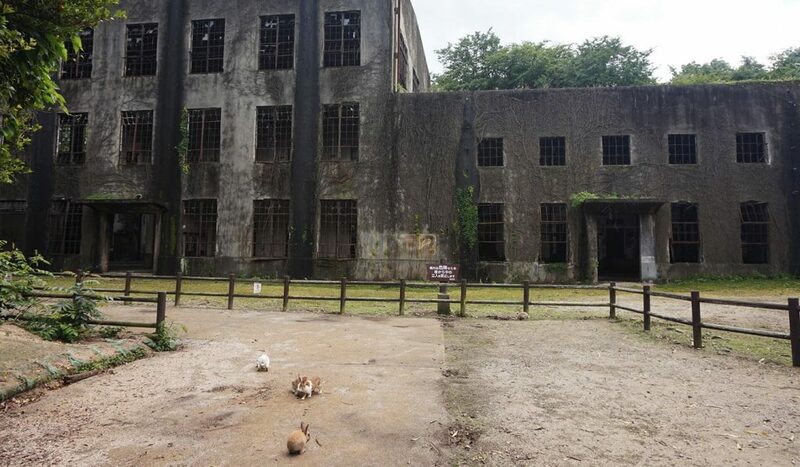 Used as a secret location for the production of poison gas to create chemicals weapons during the second world war, production facilities were created in secret on the island initiated by a program of the Imperial Japanese Army Institute of Science and Technology. Local residents and employees were not told what the plant was manufacturing despite many toxic-exposure related incidents and hard working conditions. After losing the war, documents concerning the plant and the plant itself were destroyed and the gas was dumped, burned or buried. People who knew about the project were told to keep silent and the whole operation was covered up. The Poison Gas Museum is a stern reminder of its past and is used to educate people of the island’s role during the war. After World War II, the island was developed as a park and rabbits were intentionally let loose. As soon as you set foot on the island, you’re welcomed by the bunnies that come hoping to any visitor hoping to get fed. Although wild, the rabbits are relatively tame and can be petted. Furthermore, visitors can hike the various walking trails in the mountains or enjoy the day at the beach spending time with the rabbits who often gather here. Looking as if it was the filming location of the movie Jurassic Park, Aogashima Island is remote, mysterious and very difficult to reach. 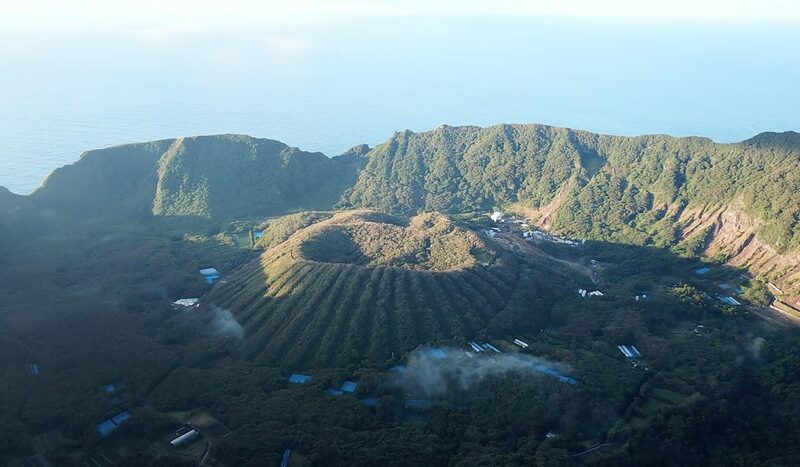 Located about 350 km from the city center of Tokyo in the Philippine Sea, this island, part of the Izu Archipelago, is surrounded by very steep rugged cliffs on all sides. The active volcanic caldera found in the middle, sits within a larger caldera giving the island an unusual shape. According to historical records found during the Edo period, the last eruption dates back to 1652, and although the last volcanic activity recorded was during 1781 – 1785, it is still considered an active volcano as steam can be seen escaping from the ground and the smell of sulfur hangs in the air. The current population is around 160 inhabitants although nobody knows exactly when the island became inhabited. One of the biggest draws of the island is its spectacular scenic views due to its isolated location and rich nature. You can enjoy scuba diving or relax yourself at the geothermal sauna at the center of the island or just take in the beauty of this unusual landscape. Getting to Aogashima Island is an adventure on itself. Visitors must first reach the remote island of Hachijojima, and then take a helicopter or ship to reach Aogashima Island. 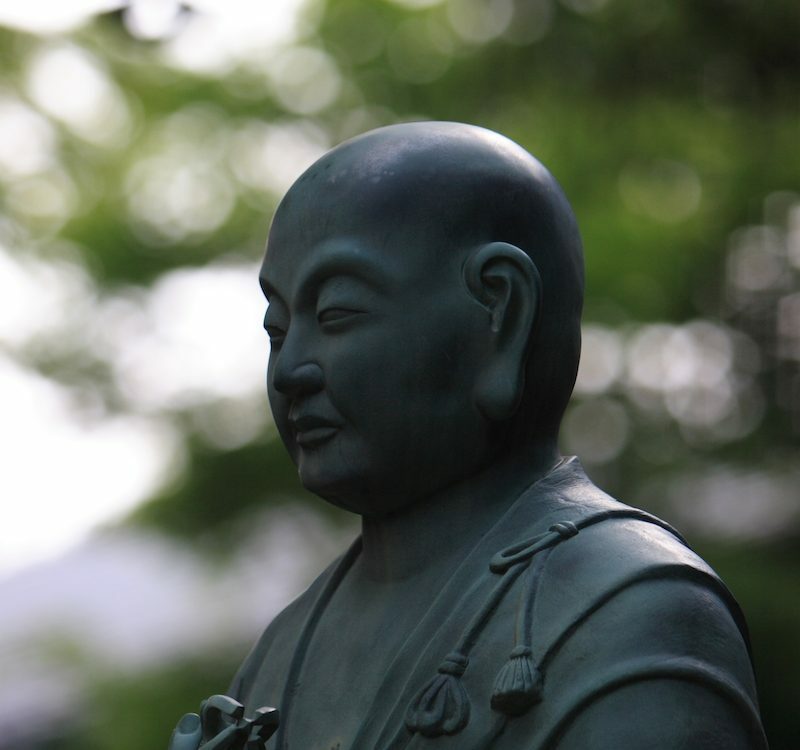 During the Edo period, Nakasendo (or Central Mountain Route), was on of the ancient routes connecting Edo (modern-day Tokyo) with Kyoto. Along the 534 km route were 69 staging-posts were wary travelers could rest and stay after days of travel. Among them Narai-Juku, the 34th of the 69 staging posts, located in present-day Shiojiri in Nagano prefecture. The flourishing post town was often referred to as “Narai of a Thousand Houses”, and the buildings from hundreds of years ago, part of Japan’s Nationally Designated Architectural Preservation Sites, are one of the best preserved in Japan. Walking through the town feels like you’re stepping back in time and there are many ryokans for you to stay at. The houses and buildings have overhanging second stories giving this town its charming character. 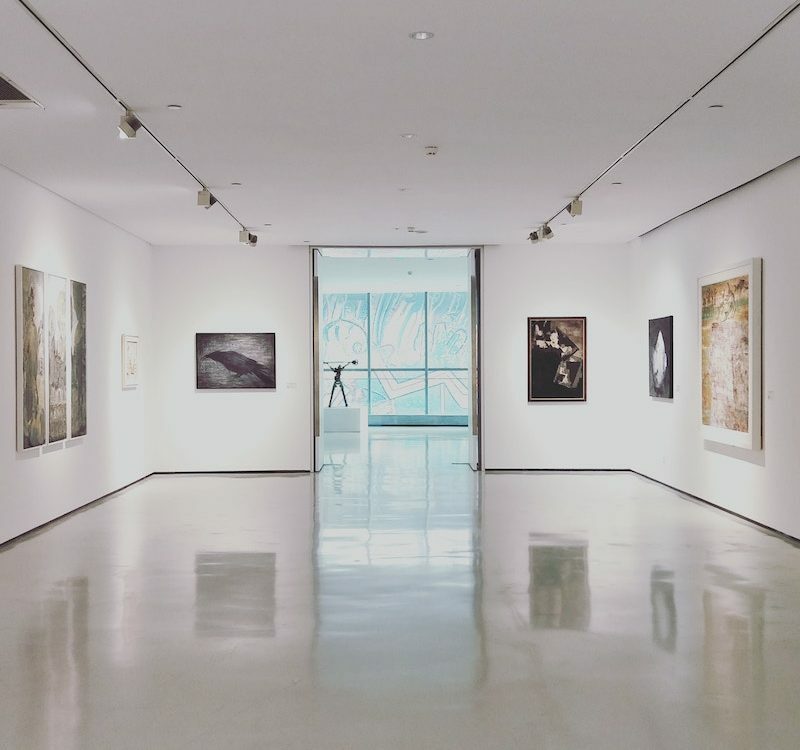 Visit the Kamidonya Museum to learn more about the history of the town, or walk over the beautiful Kiso Ohashi built from Japanese cyprus trees. 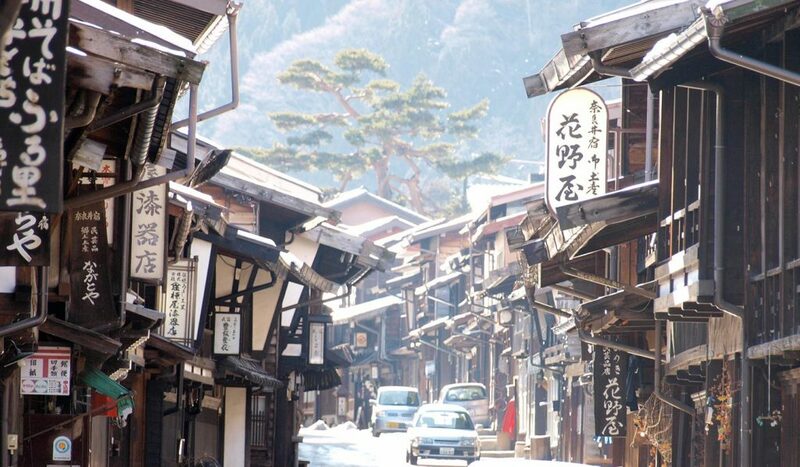 The town is also known for its high-quality lacquerware, Kiso Shikki, with many shops selling a range of beautiful wares, perfect to bring back home as a gift or souvenir. When choosing a destination for a winter holiday, Yuzawa is often overlooked in favor of other winter destinations, despite being one of the largest and easily accessible ski resorts from Tokyo. Located in Niigata prefecture, Yuzawa can be reached in two hours from Tokyo Station. Due to its location, between the Sea of Japan and the Japanese Alps, it receives one of the highest annual snowfalls in Japan. The powder snow that falls stays during the long winter season allowing for excellent snow activities like skiing. While cold, Yuzawa is also known for its many hot springs that can be found, so if you are wary after a day of skiing, know that you can rest your body by hopping in one of the nearby hot springs! 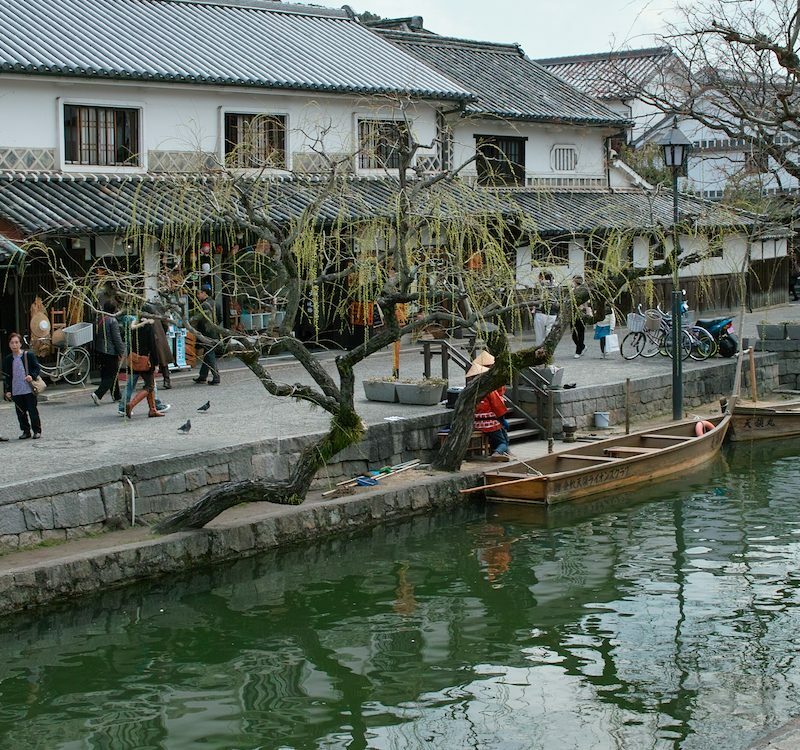 Located in Shimane prefecture and known as the “City of Water”, is the prefecture’s capital city of Matsue. Originally a feudal stronghold, Matsue is a castle town priding itself for having one of the twelve original castles in Japan. 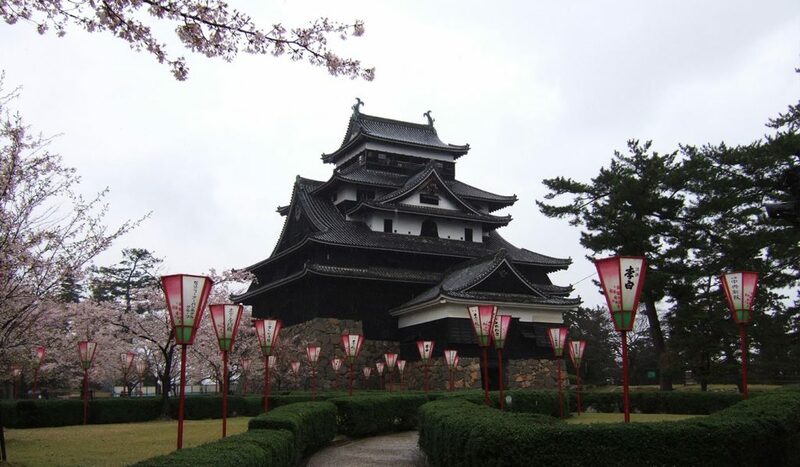 The Matsue Castle, completed in 1638, is a must-visit. It sits proudly on top of a hill, surrounded by a thick-walled moat. Interestingly, the black castle was built to withstand a war, it never actually came to that and is very well preserved. The famous western writer of Japanese culture lived in Matsue for one year and his former residence is now a museum open to the public. Not to be missed is a visit to the Adachi Museum of Art together with its award-winning Japanese garden. Lake Shinji is a nice place to relax and many local seafood delicacies can be enjoyed here. A visit to this relaxing lake-side city, with the sea and mountains within close distance, will surely create an unforgettable experience. 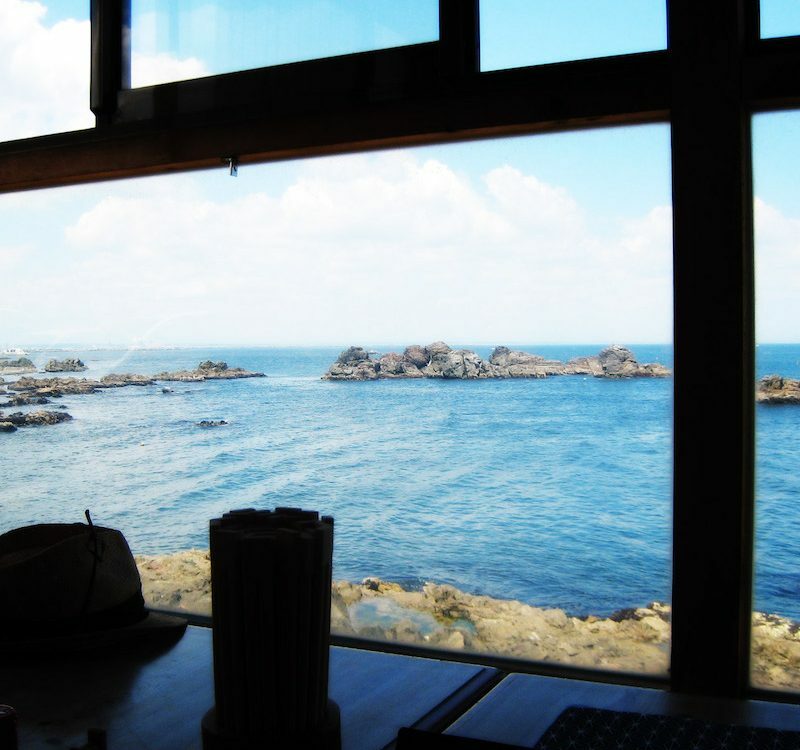 Sometimes you have to travel to the lesser known places in order to find real adventure and we hope this list of 10 incredibly underrated places will soon be part of your itinerary as you travel through Japan. 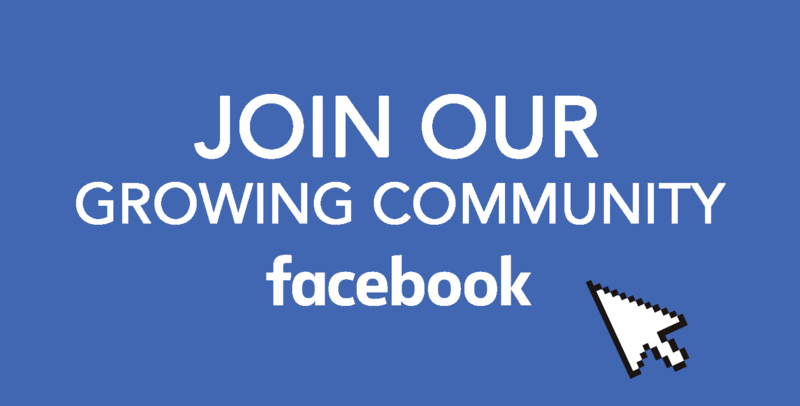 Let us know on our Facebook group what you think of our list! Don’t miss out more great news about Japan, follow us on Facebook, Instagram, Twitter, and Pinterest. My daughter went to Kyushu University in Fukuoka, which was a very nice city, and she now lives in Nagoya. I never see anything about Nagoya. I don’t know if you’re in the U.S. or Japan, but it would be nice to see information about the Aichi Prefecture including Nagoya. Tokyo is too “foreign.” People who go there from other countries think it is representative of Japan, but it’s really not. It’s a foreigners’ town. It seemed kind of phony in Tokyo. Plus, foreigners there kept commenting how “loud” the subways were and how crowded – but they’re not. In fact, the “noise” is from the foreigners. Maybe you could write something about how foreigners should be more quiet and blend in with the Japanese. Those bullet trains and subways are super quiet in other cities where it’s mostly Japanese. When I was in Kyushu, I got hollared at for speaking on a bus. I don’t speak Japanese, so my daughter had to translate for me and told me to NOT talk – that the bus driver said to turn off all cell phones and DO NOT TALK. I had broken that rule by speaking to her, but I didn’t know that. In Tokyo, foreigners are always chattering away. Go to Sky Tree and it’s all foreigners and really loud. It would be nice to have the cultural aspect added to the sights (and sites) of Japan. One place I thought was fabulous was the Zoo in Fukuoka. I had never seen a zoo before without cages. There were literally just a rope around the animals. I mean, they could have easily climbed over or under, but they stayed there. The gorillas they did put on an island… but the other animals were able to get out of their roped areas, but they never did. It was weird. And you can pet the cabybaras! Every person I know who has been to Japan and has not been there for business or school, has only visited either Tokyo, Kyoto and sometimes Osaka. All foreign-type towns. If you go to a regular Japanese town, it is quiet! And it definitely helps to know your bows and some basic Japanese. In Tokyo, you can always find someone to help you out, and then you think Tokyo is representative of Japan, but it’s not. Anyway, I’m in California, and I have heard most people describe Tokyo as being “Japan.” It’s just a city, but filled with foreigners. And “loud” compared to other parts of Japan. That’s my observation, anyway. I think it gives a false illusion of Japan by people always talking about Tokyo. It’s really not representative of the rest of non-foreigner Japan.